A leading independent Publisher of Genre Fiction, Pro Se Productions announces the release of a story collection featuring the work of one of the freshest, most vibrant new voices in Fantasy fiction. LIFTING THE VEIL: TALES OF DISCOVERY AND MAGIC is the first book to exclusively feature the work of author J. H. Fleming. “Fantasy,” says Tommy Hancock, Partner in and Editor in Chief of Pro Se Productions, “is such a wide and varied genre. So many authors claim their corner of Fantasy and turn out their epic tales or their urban fantasy stories or two fisted pulpy type fantasy yarns. In LIFTING THE VEIL, J. H. Fleming proves that she doesn’t have to claim a corner. From double barreled action to insightful characterization to creating wonderful settings where anything can happen, J. H. makes fantasy her own. Working in aspects of other genres at times, such as steampunk, she literally takes hold of what fascinates readers about Fantasy fiction and delivers it in every single story in LIFTING THE VEIL. In the Empire, rebellion is stirring, threatening everything the people have ever known. In a forgotten castle, a woman watches the world as the centuries pass, leaving her unchanged. In a forest temple, a young priestess finds the courage to choose her own path. On a high mountaintop, a Dreamer teaches his apprentice the true art of Dreaming. And on the dark streets of a coastal city, a young woman seeks revenge for the past. Enter worlds where things are not always what they seem, and the price of power could be your very life. This and more awaits readers in LIFTING THE VEIL; TALES OF DISCOVER AND MAGIC. "The stories in this collection,” says Fleming, “explore some common questions: what is it that drives us? When put to the test, what kind of person are we? Do we forgive those who have wronged us, or do we seek revenge? Do we stand by those we love, or seek our own agenda? If required, can we forsake the life we have for the possibility of something better?" 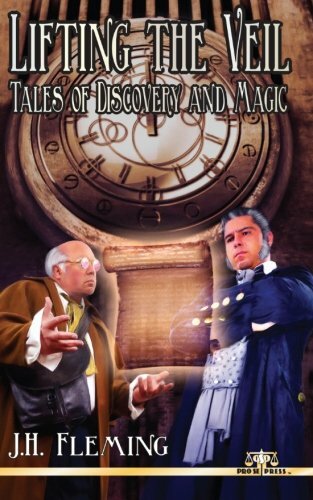 Find imagination and adventure in LIFTING THE VEIL: TALES OF DISCOVERY AND MAGIC, an exciting collection featuring stunning cover art by Jeff Hayes, logo and cover design and print formatting by Percival Constantine, available in print for $9.00 at Amazon and Pro Se’s own store at http://tinyurl.com/p23tf9v. The collection will be available as an Ebook at various outlets in the coming days. LIFTING THE VEIL: TALES OF DISCOVERY AND MAGIC NOW AVAILABLE AS EBOOK!